In virtually every other country in the world, the weights of various paper types are described by the simple definition of grams per meter squared (GMS). In Montreal, Paris, or Kabul for that matter, 52 GMS paper is heavier than 45 GMS. However we live in the USA where we boldly ignore the far superior metric system. Of course we all know if you give the metric lovers 2.54 cm, they’ll take 1.609 km. That’s why in the US we use the endlessly creative system of basis weights to define different paper weights. Basis weights are calculated based on the weight of 500 sheets of paper cut to a certain size. Simple enough, so of course they had to muck it up by using a different size for the basis of each type of paper. 60 pound cover stock is quite a bit heavier than 100 pound book stock, 50 pound book is lighter than 21 pound bond and 32 pound newsprint is precisely the same weight as 35 pound offset. There is a great web site that promises to End the Confusion. It then goes on in dense text and complex tables to prove how needlessly complex and confusing basis weights are. Web printers in the US can remain blissfully ignorant of this as we use newsprint weights pretty much exclusively. 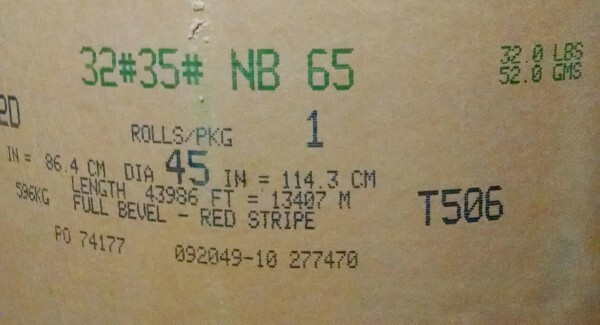 OK, so we use book stock sometimes, but we don’t need to know that 50 pound book is 46 pound newsprint. Only in America, well, actually we are not alone in holding firm against the onslaught of metric goodness. We stand proud with Myanmar and Liberia. The other 193 countries on the planet are all metric.